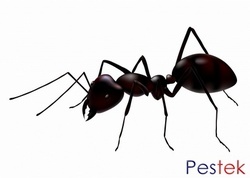 insecticide gel baits introduced over the last few years have changed the way that professional pest controllers deal with ant infestations. Designed to work slowly modern baits ensure that the whole colony is fed before the insecticide stars working. ensuring total control for the whole season. Black / garden ants are usually found outside and are the most common ant in the UK. It won�t take you long to find a colony in the summer months just about every garden in the UK will have them. Lifting a paving flag where ants have been noted will often reveal the inner workings of the nest. Garden ants cause no problems whatsoever when outside. However while foraging for food they often find their way inside and become a problem. Once a foraging ant has located a food source in your kitchen you can be sure that it won�t be long until there are hundreds. Flying Ants are the same garden / black ants ant you noted in early summer in your garden or home. Garden ants mate on the wing usually all at the same time on a warm mid summer�s day. Following the flight the mated females look for a suitable place to start a new colony. Total eradication at this stage may not be possible and you will probably see the ants again the following year. Pharaoh Ants can be a real problem and are best left to a professional. Do not spray them with insecticide as you may cause a small infestation into a very large one. Each nest has multiple queens, when the nest is under attack the colony splits to ensure survival. So before spraying with insecticide you had one nest now you have 2 or 3 and so on�Nests are usually located in inaccessible places such as wall voids, under floorboards etc. They commonly use electrical and telephone wires as a route to travel through walls and between floors. Pharaoh's Ants are common problems hotel, hospitals and shared accommodation units. Control is best left to the professionals, however recently developed ant bait gels if used correctly are very effective. The Ghost ants much smaller than the garden ant with an almost translucent body. Ghost ants are a recent arrival to the UK and are still quite rare, however the ghost ant is spreading quickly, particularly in Hospitals, Care homes and multiple occupancy developments. A ghost ant colony may well contain thousands of workers. Unlike the garden ant, nests have multiple Queens, making control much more difficult, however as with other types of tropical ants gels baits if used correctly are very effective. Red / Fire Ants are often found in gardens and are capable of giving a very painful bite. Fire ants can be quite difficult to deal with. Recently developed ant bait gels if used correctly are very effective.